When Lana’s best friend tries to reconnect with her big brother, a guy who is now part of a motorcycle club, Lana is sort of brought into that lifestyle by association. As her friend, Anna, meets and falls in love with one of the other MC members, Lana finds herself hanging out with the club more and more often. Which is where she meets Tracker. We got to see snippets of their blossoming romance in the previous book, which was Anna’s story. Now it’s Lana and Tracker’s time to shine, and boy did they not disappoint. One that that really bothered me about the previous book was how stereotypical the hero was. Technically, the whole story was a bit cringe-worthy at points between the broody hero who was wishy-washy about being with the heroine. Not only did he bounce back and forth between being with her and being with other women, but he was also rude, quick to snap at her, and just all around not a great guy. I was really hoping that that wasn’t going to be a theme in this series, and I’m so happy to say that Tracker was NOTHING like the previous men in the series. In fact, Tracker was really level-headed with all things considered throughout the beginning of their journey. For being a guy who cheated on his girlfriend in the previous books, I didn’t have high hopes for him. However, he was able to focus solely on Lana as their relationship grew. He was also not some snappy judgemental jerk. However, Tracker wasn’t perfect and had his flaws. There were moments where he clearly did the wrong thing and his whole, “we were on a break” bit at the end wasn’t enough to dig him out of the hole he put himself in. Lana was an interesting character. She didn’t question the MC like other heroines have done. She accepted Tracker as is, and when he asked her to do something, she did it. It’s not that she was spineless, she just knew that this was Tracker’s world and if he told her he needed her to stay at the clubhouse on a lockdown, she didn’t argue. With that being said, she also would stand up for herself when she needed to. Aside from her being so quick to take Tracker back after he kicks her out and hooks up with another chick, she was a pretty solid character. I really enjoyed my time with this book. It was looking like it would be my favorite of the series, but that cheating bit at the end really ruined it for me. I didn’t care for how things went down, especially since it was completely unwarranted and over-dramatic, and I really didn’t like how quickly all was forgiven. Just because you are a man who has needs doesn’t mean you hook up with someone else. And no, it doesn’t matter if you are thinking of your loved one while you’re doing it. It’s still not acceptable. 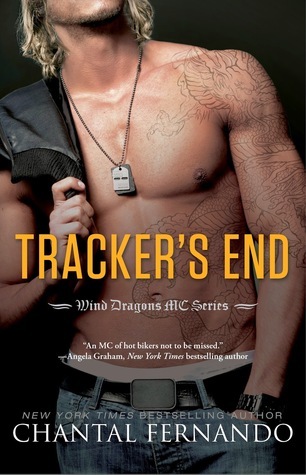 :rolls eyes: If Tracker could have just kept it in his pants, I would have enjoyed this story so much more. I’m on the fence with this series since I really don’t care for bikers but at times it sounds worth the read. Reading your review was like waving catnip at a susceptible kitty. Happy for you that this one is different than the others.